Product #1188 | SKU MF056 | 0.0 (no ratings yet) Thanks for your rating! 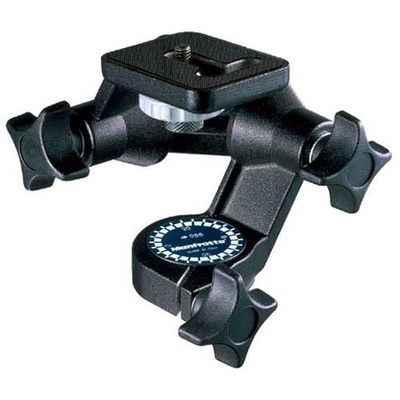 Separately locked movements on three axes make the Manfrotto 056 3-D Junior Head perfect for 35mm cameras, and the conical self-adjusting bearing surfaces on the tilt pivots provide more than enough strength to support medium format cameras. The thumb screw movement-locks used for this head keep it compact and light-weight, and won't poke you in the eye like conventional handles sometimes do. All pan heads fit any Bogen/Manfrotto tripod, or any tripod with a 3/8" thread. Replaces old item code #3025.